This post is about my personal preferences as a speech-language pathologist when counseling parents. It has nothing to do with research or evidence-based practice. It has EVERYTHING to do with my professional experience with counseling parents over the years. So feel free to read with an open mind and reach your own conclusions. In literature we see the words “nonverbal” and “prelinguistic” used interchangeably at times. I feel this provides an incomplete picture of a child’s development and functioning to parents as the terminology of “prelinguistic” is defined as “at a stage before the development of language (by the human species) or the acquisition of speech (by a child)”. Although this term may not be grossly inaccurate, it does suggest that a child is functioning at a level prior to having language. If a child is using a functional nonverbal communication system, such as sign language, signed English, PECs, low tech communication boards/books/strips, voice output communication aides, etc., I personally feel this term lacks a holistic view of the communicative strengths of a child. Your client or student may not be able to verbally express him/herself, however he/she is demonstrating understanding of symbolic language via the use of his/her functional communication system and should therefore not be labeled as “prelinguistic”. In this instance the term “nonverbal”, I feel, is a more accurate description of a child, as it suggests that although the child may not be able to verbally express him/herself, it does not leave one with the impression that the child has no linguistic foundation. In addition, through personal observation of facial and bodily emotional responses as well as tone of voice of parents/caregivers, I have come to realize the use of the term “nonverbal” is judged to be more positive a term for parents to understand and accept as compared to the use of “prelinguistic”. There are times I use both nonverbal and pre-verbal as terms for children who do not currently use verbal communication. I tend to use the term “nonverbal” for children 5 years and under who appear to have typical vision and hearing acuity. These children do not have other medical diagnoses or significant co-morbid disorders, however, they may be labeled as developmentally delayed (DD). I use the term “pre-verbal” when I am talking about children who are older and/or may have co-morbid disorders or disabilities such as genetic or acquired syndromes, childhood apraxia of speech, autism spectrum disorder or other medical diagnoses. Why the distinction? Over the years I have counseled and educated many parents regarding their child’s delays and have become a parent myself. In this time, I have come to understand a few things about parenting, empathizing with a parents’ needs, their protective instinct and the self-preservation techniques generally displayed. Keeping all of these things in mind I have made generalizations to my caregiver counseling and education that have been well received. My personal rule of thumb when educating parents is to use these terms as described above: nonverbal for children 5 and younger with no other delays (other than DD) and pre-verbal for children of all ages with other co-morbid disorders, delays, or medical diagnoses. My personal experience has been that parents whose children are simply delayed in language production and exhibit no other deficits (other than DD) not only expect to hear the words “nonverbal”, but find comfort in them as they feel I, as an SLP and specialist, support their instinctual concern that their child is not developing language as compared to his/her typically developing peers. However, parents whose children have a number of co-morbid disorders, delays or medical diagnoses, are struggling to digest all of the medical and educational information being thrown at them. I can help by simply changing the way I share my view of their child’s strengths and weaknesses. 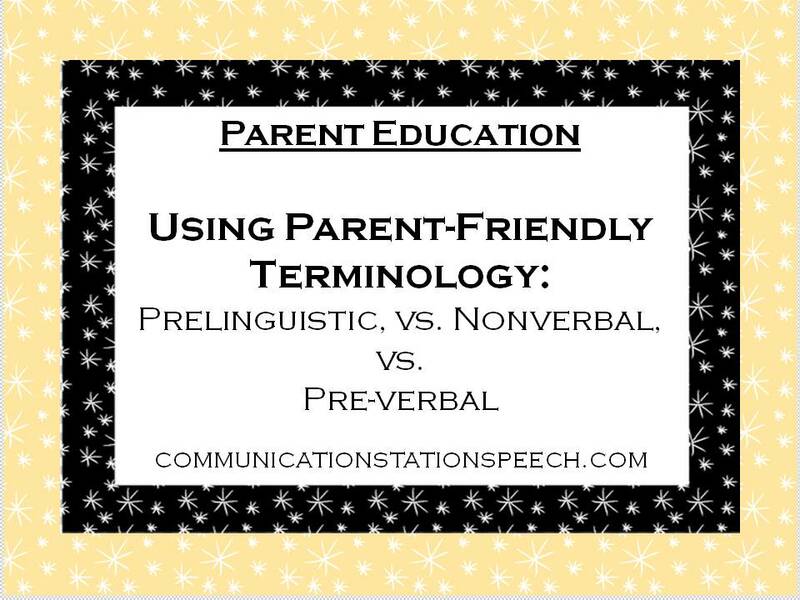 By using the term “pre-verbal” with this particular group of parents, I am accepting the fact that their child is not currently verbally expressing him/herself, however I am also sharing in their hope that their child will one day use verbal communication (whether primarily or in supplement to other communication systems). I have found by simply changing this one term in my counseling/education sessions, parents become more open, understanding, accepting and in support of the speech therapy process. Again this is not based on any research study but rather on my personal clinical experiences with families and my feelings as a mother. It’s just something I wanted to put out there for SLPs to read and think about. When we are sharing our evaluation results and counseling our parents are we supporting them where they are in their process of grief or understanding? Are we supporting their parental instincts? Are we sharing in their hope?